48% of Canadians adults could have difficulty reading this sentence. Home > 48% of Canadians adults could have difficulty reading this sentence. Montreal-September 8, 2011: Four out of 10 adult Canadians, aged 16 to 65 or about 12 million Canadians, struggle with limited literacy. Poor literacy skills can lead to a lifetime of economic, social and health insecurities for individuals and their children. Today is International Literacy Day. The Montreal Children’s Hospital along with The Centre for Literacy are highlighting the continuing challenge of literacy in Canada and the link between limited literacy and poor health. As well, with the help of Canadian Space Agency Astronaut Robert Thirsk, the hospital and The Centre are also paying tribute to iconic Canadian writer and literacy advocate Roch Carrier, author of The Hockey Sweater, by naming the hospital’s reading corner in Mr. Carrier’s honour. Studies show 60 percent of the Canadian population struggles with literacy in the context of health. That is, they cannot identify, understand, interpret, create, communicate, compute and use printed and written materials to manage their own health care or that of their children. In Quebec, the statistics are even higher. People with poor literacy have trouble finding and understanding health and safety information, are more likely to develop chronic illnesses such as diabetes and asthma and are less likely to receive regular health services. Daily reading has been identified as the single most important factor in improving health literacy. Lire/Imagine/Read gives a book to children aged 0 to 5 years old in their mother tongue at select clinics. Parents are given a bookmark and information on the importance of reading for child development. 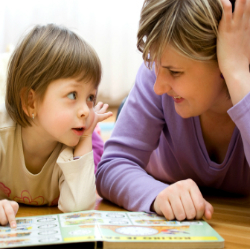 They are encouraged to visit local libraries and or bookstores to continue the habit of reading to their children. The program has volunteers reading to children in waiting areas. “Even if parents are unable to read well, we encourage them to go through a book with their young child and make up a story to match the pictures. This simple gesture will help lead their child to read and appreciate books,” says Linda Shohet, Executive Director of The Centre for Literacy. To mark International Literacy Day, The Montreal Children’s Hospital and The Centre for Literacy are joined by Canadian Space Agency Astronaut Robert Thirsk to dedicate the hospital’s reading corner in honour of Roch Carrier. The Roch Carrier Coin de lecture/ Reading Corner is located on 2B, the hospital’s clinic area where over 125,000 children per year come for their doctor’s appointments. Astronaut Robert Thirsk adds a wider perspective to the dedication. During his 2009 six-month expedition aboard the International Space Station (ISS) Dr. Thirsk brought along a copy of Roch Carrier’s book The Hockey Sweater. Dr. Thirsk said he chose the book because it is a family favourite and he believes that reading is an important educational foundation. During a recent interview, Dr. Thirsk said bringing The Hockey Sweater into space was a no brainer. He fell in love with the story as an adolescent, and introduced it to his three children when they were old enough. Reading is an important part of his family’s, and of his everyday life as well, Thirsk said. “Astronaut training is a little like drinking from a fire hose,” he said, meaning there is a lot of information to take in over a short period of time. “We can’t do our job if we don’t have reading skills,” he said. In 2009, Robert Thirsk became the first Canadian astronaut to fly a long-duration expedition aboard the International Space Station (ISS). He and two crewmates launched from the Baikonur Cosmodrome in Kazakhstan on May 27 aboard a Russian Soyuz spacecraft. When their Soyuz vehicle docked with the nearly complete Station two days later, the ISS became home for the first time to a permanent crew of six. As members of the ISS Expedition 20/21  crew, Bob and his five international crewmates performed an unprecedented amount of multidisciplinary research, complex robotic operations, and maintenance and repair work of Station systems and payloads. Following the undocking of his Soyuz spacecraft from the Station and landing back in Kazakhstan on December 1, Robert Thirsk had lived and worked in space for another 188 days during this second voyage to space. Robert Thirsk is a strong promoter of a Canadian economy based upon exploration and innovation. He encourages young Canadians to build their dreams upon a solid educational foundation and advanced skills. Roch Carrier is a Fellow of the Royal Society of Canada, an Officer of the Order of Canada, and a recipient of the Stephen Leacock Medal. He holds honorary doctorates from the Université de Moncton in New Brunswick, York University in Toronto, Memorial University of Newfoundland, the Royal Military College of Canada in Kingston, Ontario, and Bowling Green University in Ohio. From 1994 to 1997, Mr. Carrier was director of the Canada Council for the Arts, after which he turned his focus to travel, studying and writing. In 1999, he became Canada’s fourth National Librarian, a position he held until 2004. He has been honorary chair of the National Adult Literacy Database (NALD) since 2005. Several novels written by Mr. Carrier are considered classics and are taught in schools and universities around the world, in both French and English. Some have been translated into foreign languages. He has also written plays that have been produced both in Canada and abroad. The Centre is a Montreal-based research, resource and professional development organization and a national centre of expertise on all aspects of adult literacy and essential skills. The Centre has done pioneering work in health literacy research and action, much of it in collaboration with the McGill University Health Centre. The work includes patient information navigation kits for breast and prostate cancers. The Centre is a partner with The Montreal Children’s Hospital on Lire/Imagine/Read.